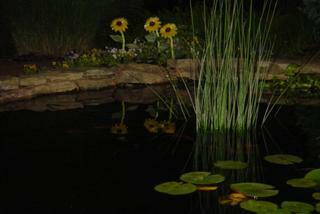 Night scene of the water feature at Greenscape Gardens. We have created several large permanent display gardens at the garden center. NO OTHER GARDEN CENTER IN ST. LOUIS OR ST. LOUIS COUNTY HAS MORE DISPLAY GARDENS THAN GREENSCAPE GARDENS. We are creating a garden center environment with mature plantings to encourage the St. Louis gardener to "stop and smell the roses". The koi/goldfish pond pictured here is just another example of our commitment to the St. Louis gardening public.